Modern cloud-native applications often focus on architectural styles such as microservices, function as a service, eventing, and reactivity. 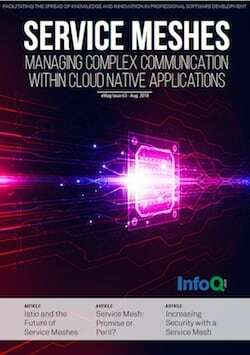 Cloud-native applications typically run within virtualized environments — whether this involves sandboxed process isolation, container-based solutions, or hardware VMs - and applications and services are dynamically orchestrated. Although this shift to building cloud-native systems provides many benefits, it also introduces several new challenges, particularly around the deployment of applications and runtime configuration of networking. Some of these technological challenges have been solved with the emergence of de facto solutions: for example, Docker for container packaging and Kubernetes for deployment and runtime orchestration. However, one of the biggest challenges, implementing and managing dynamic and secure networking, did not initially get as much traction as other problem spaces. The service mesh space is a rapidly emerging technical and commercial opportunity, and although we expect some aggregation or attrition of offerings over the coming months and years, for the moment, there are plenty of options to choose from. This book will help you decide if your organisation would benefit from using a service mesh, and if so, that it also guides you on your service mesh journey. We are always keen to publish practitioner experience and learning, and so please do get in touch if you have a service mesh story to share.